Pump & Valve were approached by a customer with an application of packaging honey on a plastic jar packaging line. The pump needed to draw from several different tanks, having a suction line up to 6 metres long and the discharge being into the packaging line in the room next door, that fills honey jars varying in size. Mouvex SLS8. 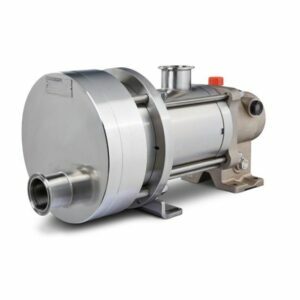 Due to the length of the suction and discharge lines, the cost of product loss when changing between honey types would be substantially more if a product recovery Mouvex was not used. The gentle action as well as its seal-less design maintains excellent product structure and no aeration in the filled jars. The Mouvex also has excellent repeatability, so the accuracy of the jar weights was extremely high. This is very important as the plant specializes in contract packaging, so it needs to be able to recover the most product possible – some batches being reasonably small.